You might think, after our long first day of flying into and then walking up and down the streets of Boston, day two would involve sleeping in, but, no, at least not for me. I woke up bright and early. 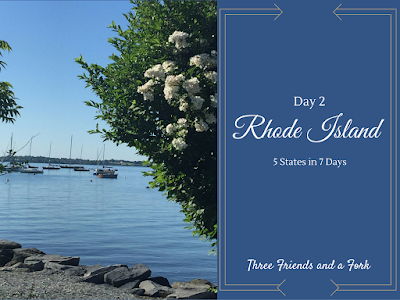 After we left Boston, we drove to Jamestown, RI on Conanicut Island to check into our accommodations. We had arrived so late that it was really hard to tell what things looked like, so I was anxious to get a glimpse of my surroundings. As soon as the morning light began streaming in through my bedroom windows, I jumped out of bed and stepped outside onto our deck. What a lovely surprise! Our rooms at the Wyndham Bay Voyage Inn looked right out over Naragansett Bay. The sun was shining over the amazingly calm water, studded with dozens of boats and bedazzled with thousands of diamond sparkles. If I looked to my left, I could see the pretty suspension bridge we had driven over the night before. Farther on down to my right, I could see the road curving along the shoreline, dotted with with houses along the way. The coast was rocky near the road with coarse gray sand along the edge of the water. Our tiny island was only 9 miles long and 1 mile wide and I was anxious to explore. I quickly dressed and tiptoed outside, so as not to disturb my sleepyhead roommates. I decided my best bet was to walk along the road that curved along the water. It was a beautiful day, surprisingly cool and without the suffocating humidity we had left back in Alabama. I enjoyed looking at the homes and trees, as well as the gorgeous ocean view. The majority of the homes were shingled with gambrel roofs which gave them all that quintessential "barn" look. I'm not much of a botanist, so I couldn't identify the unusually dark trees on the island, but they were striking. The leaves were so deep and purple they appeared to be black. I asked several of the locals, but they had no idea either. I stayed on the water's edge until I came to an enormous condominium complex situated on a corner that appeared to veer off into a downtown area, so I hung a right and kept walking. Pretty soon I found myself in a quaint little downtown district full of one of a kind shops and eateries. I learned that there are no chains of any kind on Conanicut Island (you should hear Siri pronounce that) and the island has only one gas station. I was beginning to get a little hungry when I passed by a tiny cafe called Slice of Heaven. Who can resist that! People were sitting at tables on the outside patio and seemed to be enjoying themselves, so I climbed the stairs and ventured on in. A line had formed inside the small cafe, so I followed suit and studied the cloche covered plates of muffins and pastries on the counter. Oh, brother, this was not going to be an easy decision. Additionally, Slice of Heaven had omelettes, breakfast sandwiches, smoothies, yogurt, coffee, pancakes and lunch items. I finally selected a ginger lemon poppyseed muffin, but we came back to Slice of Heaven at least two more times before the week was over. Over the course of the week, we sampled more muffins, I tried a breakfast sandwich and Dede enjoyed some banana pancakes. I think the muffins were still my favorite, especially the ginger lemon poppyseed and the blueberry versions. By this time, my buddies were ready to head out, so I made my way back to the Inn, we jumped in the car, drove back over the Newport Bridge and headed into Newport. There were several things we wanted to see in Newport. First of all, we wanted to see the mansions and we wanted to hike along the famous Cliffwalk, which runs along the rocky beach at the back of Newport's enormous mansions. We started out on the 3 1/2 mile Cliffwalk, but pretty soon realized we weren't going to be able to get a good look at the homes if we continued. We decided to cut back over to the main road so we could see the front of the houses. The old mansions, or summer cottages, are all magnificent, each one unique. Ochre Court, the second largest mansion in Newport is now home to Salve Regina University. The largest and most famous of them all is The Breakers, built by Cornelius Vanderbilt II. Construction began in 1893 and the house was finished in 1895. The place is massive...62,482 sq. ft., 5 floors, 70 rooms, and 20 bathrooms, but it still is nowhere near the size of Biltmore (built by Cornelius' younger brother George Washington Vanderbilt II) at 135,280 sq. ft. The view from The Breakers is spectacular. The rear of the cottage looks out over the Cliffwalk and beyond. Upper loggia on the 2nd floor opens to sweeping views of the Atlantic. One of 20 bathrooms, this tub was carved from a single slab of marble and weighs approximately one ton. Let's be honest here, the house was grand, but my favorite room had to be the kitchen. In fact, this may be my favorite kitchen of all time. It is enormous, with high ceilings and lots of natural light. The long worktable in the center is covered in zinc with a rack above to hang the gleaming copper pots. The ice room, where ice was stored, was much cooler, so it was also the place for making pastries and confections. But the piece de resistance, at least to my mind? The 21 foot cast iron stove with no burners. The solid top heats up as a single element so the cooks could heat up a pot anywhere on the stove! Talk about ahead of their time! 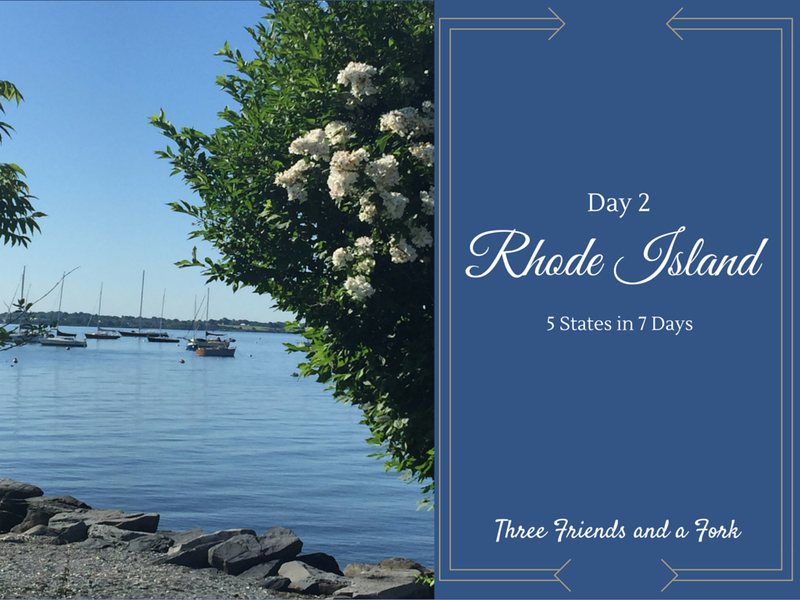 I thought I could finish up day two in one post, but we just crammed too much into our days. Next time, I'll close out our shenanigans in Newport and then we will move on to Providence. Yep! That was all in day two! Until next time, have muffin will travel! Three Friends and a Fork give 3 Grand Yums UP to Slice of Heaven, Wyndham Bay Voyage Inn, the town of Jamestown and The Breakers!